JANIS NOWLAN BAND "The Most Unforgettable Dance Party Of Your Life"
Award Winning Janis Nowlan Band Features Outstanding Singers And Powerhouse Horns Rocking The Latest Hits And Irresistible Favorites Tailored To Your Celebration For The Most Unforgettable Dance Party Of Your Life! Chosen NBC America's 15 Best Wedding Bands Best Philadelphia Band, 1st Delaware - Philadelphia Band Voted Into The Knot Best Of Weddings Hall Of Fame Based On Verified Reviews! WeddingWire Couples Choice! The Knot Best Of Weddings! Presidential Inaugural Ball Party Band! Consecutive Winner Of The Knot Best Of Weddings From 2007 to 2019 And WeddingWire Couples' Choice Awards From 2011 To 2019, The Janis Nowlan Band Is Greater Philadelphia's Consistently Top Rated Best Live Music Dance Party Entertainment! The Celebration Of Your Dreams! Inspired Singers, Powerhouse Horns, Keyboards, Guitar, Bass, Drums, Congas! Award Winning Janis Nowlan Band Is Amazingly Versatile, Professional, So Fun! Confidently Plan The Wedding Celebration That Your Guests Will Rave About And Always Remember With A Spectacular Live Music Repertoire Tailored To Your Taste Melding Genres And Generations. Party With The Best! My wedding wouldn’t have been the same without Janis Nowlan Band. From the first time we went to one of their showcases, we knew we needed them to bring their talent, their energy, and their finesse to our once in a lifetime day. It is evident from the phone calls we had with Janis in the months prior to the wedding that she works tirelessly to deliver perfection... from the ceremony starting at 5:30 to midnight when the night was over .... Janis Nowlan Band was nonstop, absolute perfection. Going above and beyond, they even learned two entirely new songs... and one of them was our first dance. We were SPEECHLESS. My eyes filled with tears as I tried to remember the steps for the dance we rehearsed. Hearing them sing our requested song for the first time after months of anticipation was a moment we will never forget. It meant so much to us. We will never forget how all 180+ guests were on their feet dancing for the majority of the night with us. It was a wonderful and surreal experience. The biggest compliment we continue to get after the wedding is “ Your Band was outsdtanding!” ... they truly were and we are so thankful and thrilled that we were able to have them. First of all, 5 stars is nowhere nearly enough! Secondly, this very talkative woman does not know where to begin when talking about Janis and her crew..
Third, what's a mom to do when her adult,professional daughter and her partner plan and pay for their own weddding? "YOU BUY THE BAND. "...So glad I "bought" Janis Nolan Band! I knew I wanted them after attending a showcase more than a year before the wedding. My ONLY requests were : I want a great party,have great people with great vocals playing great instrumentals . Have a crowded dance floor from the minute the party started til the last guest left..Have the guests drag themselves out since their feet hurt from dancing so much . I wanted a fabulous party and that's what I got.....and more! I made a new friend. From the first minute I met Janis she was so easy to talk to.In the months leading up to the wedding ,the many conversations initiated by her to make sure we got everything we wanted were so special. She was so thorough and made sure everything we wanted would be done. The entire evening was amazing, but all people talked about that night and still do a month and a half later was ...THAT BAND ..WOW WHAT A GREAT BAND! I got the party I asked Janis for and she and her crew did not disappoint ! In the words of the great Frankie Vali "OH WHAT A NIGHT! One of the best decisions we made was to hire the Janis Nowlan Band. We went to one of their showcases and knew right away that this was the band for us. Fast forward to our wedding day and Janis did not disappoint. They were absolutely fantastic!!! Throughout the whole process, Janis was responsive, professional and very easy to talk to. It's been over a month since our wedding and we still receive compliments on our band selection. Several friends have inquired about hiring Janis for their weddings. Do yourself a favor and do the same!! They will make it a night to remember. Three words: "Hire this band." Janis is the ultimate professional, working tirelessly beforehand to ensure the perfect playlist and reading the crowd during the event to tailor that playlist to the actual crowd. Everyone was up and dancing from the first song to the last. The Janis Nowlan Band is hands-down the most amazing addition you can add to your wedding celebration. Janis is an expert at working the room and building excitement, and the band is made up of world-class musicians. Our wedding saw people on the dance for for the ENTIRE duration of the evening, and I am confident that the Janis Nowlan band was a key driver behind this amazing atmosphere. 5 star seasoned performers. Janis Nolan and her band kept the dance tempo just right from the cocktail hour to our dinner dance venue. No one, from 18-85 years, left this wedding without spending time on the dance floor, raving about this amazing band. Janis Nolan is the best hands down! The Janis Nowlan band was absolutely incredible! They were the band for our wedding in August and completely blew us away. All of our guests were dancing the entire time and were raving about the band then and continue to do so now. The music was amazing. Janis is extremely thorough and spent time talking to me on the phone going through every detail. The Janis Nowlan band truly helped our dream wedding come to life!! Fantastic Band, Great people, a joy to work with!! Do you want everyone dancing at your wedding? Do you want talented vocalists? Do you want superb musicians? Do you want a fantastic MC? If you answered YES to these questions, then you better call Janis to book them quick! Every single one of my guests gushed about how amazing this band is. Every time I looked around, not a single person was sitting. Even my mom danced, and she NEVER dances! Leading up to the wedding, Janis will work with you to create your perfect playlist and is more than happy to take special requests (just make sure you do so a couple months beforehand). No one wanted the last song to be over, and when it did, everyone stayed on the floor to give them a huge round of applause. Best band ever!! We had a fantastic experience working with the Janis Nowlan band. We attended a friend's wedding and knew they HAD to be our wedding band. They had everyone on the dance floor all night long. Janis is very accommodating and detail-oriented when planning the evening. She called to confirm she had the appropriate line-up of events such as toasts, dances, etc. and she made it a point to learn everyone's names in our wedding party. Thank you for the best party of our lives! 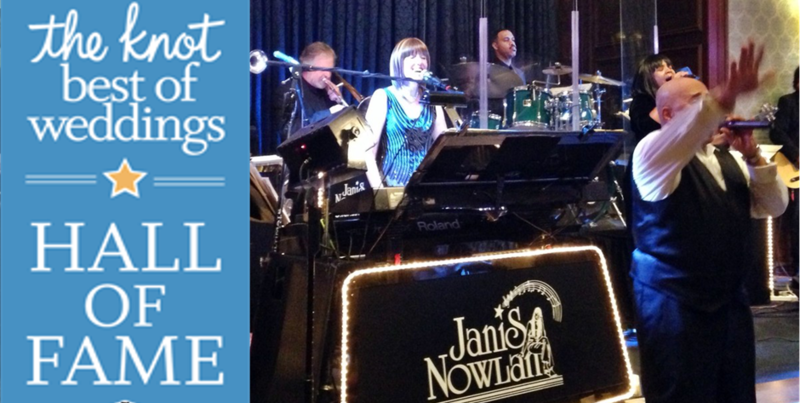 We recommend the Janis Nowlan Band to every couple looking to have a lively and fun reception! The Janis Nowlan Band made my daughter's wedding such a success! The guests did not stop dancing or talking about how great the band was. I would recommend them for any celebration no matter how big or small. Super nice too! The Janis Nowlan Band was so much fun! Planning a wedding out of town, we had to go by wedding reviews and YouTube videos to choose our band. My mom and aunt were able to go to a showcase and give us a report. My aunt called me excitedly after the showcase and said we HAD to book them! We never heard the band live until our wedding day, which I realize is somewhat untraditional, but it was a super lucky gamble. Janis played piano during our ceremony. She even learned John Williams' "Jurassic Park Theme" for us to exit our ceremony to! Then there was jazz music during our cocktail ceremony. The big band played for the whole reception. I loved talking directly to Janis on the phone to organize the night. We chose all of the ceremony music together, then the entrances. The band learned a new song for our first dance too. My husband was able to choose a few songs to play with the band, which was a huge highlight of our night (video is on their Facebook). He did not practice with them ever, but they pulled it off seamlessly! One of the things that impressed me most is that Janis said they didn't really play with a set list, they adjusted based on the crowd. Our families were up dancing all night. The Janis Nowlan Band is a group of super talented musicians, with fun personalities, who seem like they really love what they do. They were a wonderful addition to our wedding and I would highly recommend to anyone wanting live music. Working with Janis Nowlan and her band was such a wonderful experience. We started our journey sampling different bands for our special day and instantly knew that this band was the perfect fit for us. We just couldn't stop dancing! We wanted a team of people that could light up the room and get people out on the dance floor! You can't help yourself but dance and sing along with the band. Their music just brings everyone alive! Every single member of the band is enthusiastic and animated. They play such a diverse range of music and found a way to appeal to every guest at the celebration. Janis, the band leader, gave us nothing to worry about. She was excited for our wedding and often called to chat about our wedding day to ensure that it was perfect, and it was. Janis and her band learned to play my father/daughter dance song that my father and I danced to when I was in fourth grade! The song and the dance will be cherished forever! Janis asked us what kind of music we were looking for and our only request was that we wanted them to fill the room with energy and keep our guest dancing. We have never danced so much in our lives!!! They ran the show so flawlessly and really made our celebration special. So many of our guests had so many amazing things to say about the band! Everyone truly had a remarkable time! We can't wait to become their newest groupies and follow them around to hear them play! It's really an experience everyone should have. Their music fills the heart with happiness! You are truly missing out if you don’t choose the Janis Nowlan Band !! This should be your easiest decision during your wedding planning. Janis Nowlan and her team of amazingly talented and versatile musicians and entertainers made our night one to remember. From our cocktail hour straight through until the end of the night, Janis and her band left us and our guests speechless. Everyone was on the dance floor all night long, which is exactly what we wanted at our wedding. After talking with us to get a sense of what we planned for our dance floor, Janis arranged the perfect mix of music to keep guests of all ages happy and energized throughout the night. We couldn't have asked for a better, more fun, or more professional experience! Book her! You know you are partying with the best when you party with Janis and her band! She is amazing and made our reception tons of fun from beginning to end. Janis and all the band member were super nice and fun to dance and sing along. My family is from Venezuela, my husband's from Philadelphia and everybody had a wonderful time with the music. Janis and the band worked hard to adapt the music repertoire to all tastes and cultures, and offered a welcome environment to everybody could hit the dance floor. I think I barely sat down during the whole night because it was so much fun every song they played! First saw the Janis Nowlan Band perform years ago, they were absolutely phenomenal and they have only gotten better since! Our daughter's wedding was a blast, everyone was still on the dance floor at the end of the night and no one wanted the music to end! They are in the business of making dreams come true and they are better at it than anyone! Incredibly talented musicians who are an absolute pleasure to deal with, love, love, love them! Can never thank them enough! Easy to work with. Had everyone dancing and the best band ever! H. Could never say enough about Janis! Best band ever! The band is amazing. We had been to other events where they played but this time was our daughters wedding. They are so personable and definitely make a grand party. Thank you Janis and band!!!! Janis and the band were amazing! I am an older bride and wanted a band that would make for a great party. I picked the right band! Janis was helpful prior to the wedding helping me with my timeline, (I didn't want to do typical wedding stuff throughout the night), was great when I asked her to shorten our first dance song and created a spot on dance list suited for our guests. Everyone had a great time. I have to apologize to my guests if I didn't get around to see them at their tables, but once dinner was over no one was sitting for the rest of the night! The band was outstanding and I highly recommend the Janis Nowlan Band to use at your next event! There are not enough words to express how much I LOVE this band nor is there enough stars to rate them! I always told myself that when I got married I would have a DJ instead of a live band. Well, that all changed when I got the chance to see the Janis Nowlan Band play at a friends wedding. I was in love and instantly hooked! I knew that this was the band I wanted for my wedding. As soon as my husband and I were engaged, I contacted Janis. I then took my husband and my parents to one of the band's showcases and they were blown away! Janis is an incredible person! During the entire planning process she checked in and asked about our family and it felt like we had known her our whole lives! When the big day started to get closer, Janis made sure she took care of everything. We were able to pick our wedding song and parent dance songs as well as all the songs they played at our wedding. This band has no limits! They can play anything from country to soul to pop to rock, even the popular novelty dances! We went over introductions, ceremony music, cocktail music, EVERYTHING. Janis made sure that I had one less thing to stress about. When it came time to dance, the amazing band was incredible and they didn't miss a beat! They had everyone from my 1&1/2 year old daughter to my 92 year old grandmother on the dance floor! We had the perfect wedding and I have to give a big thank you to the Janis Nowlan Band for being a big part of that perfect day! Hands down the BEST wedding band in the area! We were fortunate enough to see Janis Nowlan and the band live at a friend's wedding and when my husband and I got engaged, there was no question about who we were going to call first. Janis works with you directly and is the epitome of professional. She also is genuinely excited about making your wedding day special and getting your guests on the dance floor. We worked together to plan the day-of-schedule, so it was tailored to our needs and wants (like getting people dancing right away, when to do the special dances, speeches, cake cutting, etc). She and the band also learned some special song requests we had and did a dance-off, which our guests loved. So many guests commented on how great the band was and that it was the BEST that they have ever heard. I may be bias but I agree!!! Thank you Janis, Rick, & band!! We had the pleasure of having the incredible Janis nowlan band perform at our wedding on 9/25/16. After an initial phone call with Janis, we attended their showcase. They were the only band we went to see, by far the best out of all the weddings either of us have been to... so right then and there we cancelled our plans to see other bands, they were that amazing! When it comes to planning, Janis is so organized and on top of your wedding schedule, and she is so warm and cheerful on the phone it was always a pleasure to hear from her throughout the wedding planning process. We had so much fun choosing the songs we wanted for our setlist and narrowing the songs down was so hard because they have an incredible range. They even agreed to learn my husbands favorite song which is an obscure Grateful Dead song called Peggy-O... the guitarist/singer knocked it out of the park ! We had them for our ceremony, cocktail hour and reception. They did an amazing job with our introductions and hora and kept everyone dancing all night, even my mother who I have never seen dance before. Our guests were literally looking at each other in amazement at how good the band was, and so many people commented that their songs sounded just like the originals. When they called the last song we couldn't believe it was already over, and now we wish we could have another party so we can bring Janis and her band back! We had an outdoor wedding at the waterworks which is a public space, we found out later that when they heard the music, passerbys stopped to dance in the street for hours! Do not hesitate to book the Janis Nowlan band, your guests will be so impressed when they walk in and see the 13 piece band on stage... then after the party they won't stop raving after they've heard the BEST!!! When looking for a wedding band, one of my criteria was that I wanted guests dancing so much that the guys were splitting their pants. Janis Nowlan band went one step further! I thought everyone was going to fall through the floor! So many people dancing! They know the exact mixture of art and science to getting EVERYONE out on the dance floor and keeping them there, having a good time. They played for 4-5 hours straight. No band breaks! Granted it was my wedding but I have never had so much fun in my life and I even got to sing a song with the band to my bride. It is almost a month later and the wedding is all friends and family are talking about. Kudos to Janis and her band. They are amazing! My husband and I are so glad we chose to have Janis and her band celebrate with us on our very special day. They are a group of vibrant and talented people that had all of our guests in awe. The dance floor was full throughout the whole night. Our friends and family cannot stop talking about how amazing the band was and how sore they were the next day! Bandleader Janis was such a delight to work with. She was so very professional and organized, and did not hesitate to give us feedback/recommendations that we as a couple greatly appreciated. Janis and her band truly are the best and no one can compare. Thank you for making our day extra special and memorable!! When my daughter and son in law were planning their wedding, they wanted to be sure to have a fantastic band. They are from out of town, so I went to preview the Janis Nowlan Band at one of their showcases. They blew me away! Fast forward to the wedding a week ago-- they were AMAZING! Not only did they provide beautiful prelude, ceremony and cocktail hour music, but the dance floor was packed from start to finish! They kept the party moving and we had so much fun that we didn't want the night to end. So many of our guests have commented that they are the best wedding band ever, and we agree! Janis was wonderful to work with and she and the band learned two very important songs for us (father of the bride dance and sentimental dance for bride) and performed them beautifully. Don't hesitate--hire them, you'll be glad you did! We had the honor of having the Band preform at our wedding on 7/29. They made the day so enjoyable and we really didn't worry about anything. Janis was so accommodating to what we wanted to hear and also let my sister preform a song she wrote for our wedding song. She is a class act and a pleasure to work with. I strongly recommend her and her band to everyone. They play everything. And are such great performers. When my husband and I started planning our wedding we agreed that there were three main things that make a wedding great: good food, free alcohol and great music. To say that the Janis Nowlan Band was great is a major understatement. These guys were phenomenal from day one. Janis is thorough and gets to know the bride and the groom and is sure to make everything unique and special for the big day. She made sure of every detail. At the wedding, everything was just how we imagined it. They played for our ceremony, cocktail hour and reception. At the reception our guests (grandparent included) were on the dance floor from start to finish. Throughout the night I had guests asking about the band so they could recommend them to other couples. We are so pleased with their performance. I would recommend the Janis Nowlan Band to any Bride and Groom who are looking to dance the night away! We don't even know where to begin to express our gratitude to Janis and her Band for the wonderful performance they put on at our daughter and son in laws wedding. Our guests are still raving about it. The dance floor was packed non stop from the start of the reception to the end. We knew the first time we heard the Janis Nowlan Band we had to have them at our wedding and we now know we picked the BEST band around. The energy in the room that night was phenomenal and we owe it all to them. Alyssa and Tom had the times of their lives as did all of us. Janis and her band were terrific to work with during our whole planning process and we will highly recommend the Janis Nowlan Band to anyone and hope to see them again. If I had 10 thumbs they would all be up right now. WOW! What a fantastic time we had at our son and daughter-in-law's wedding! It wouldn't have been the same without the Janis Nowlan Band. From the cocktail hour to the last song of the night, reception guests couldn't say enough about how awesome, fantastic, wonderful, and out-of-this-world the band was. No one could resist the urge to dance. Even guests who "never dance" couldn't stay off the dance floor. We all seemed to be under the spell of the magical, musical masterpiece performance of the Janis Nowlan Band! Kudos to all of the band for their superb talent, perfect personalization, and ultimate professionalism. The energy was contagious, the timing impeccable, and the entertainment exhilarating! Thank you from the bottom of our hearts for making this event the "wedding of the decade"!! I don't know even where to begin: we LOVED everything about the Janis Nowlan Band for our wedding at the Constitution Center. Definitely go to one of their music showcases to check them out, and you'll get chills! We wanted a very Philly-themed wedding, and they helped us do just that with everything from Philadelphia Freedom to Fly Eagles Fly. They can play just about any song from any era! EVERYONE was dancing, and we are still receiving compliments on how great this band was at our wedding! The whole band is super nice and friendly and they have so much fun doing what they're good at, and it shows! Janis was super professional and easy-going. I loved working with her to plan my wedding and hope that we can work together again in the future. The band was non-stop awesome! I had a great time at the Sprandio/Ells reception and the band played a major part in that. It was truly a memorable night. I met Janis Nowlan and her Band nine years ago when they agreed, on short notice, to perform at my wife's 50th birthday party. They were fantastic! Since then Janis and the Band have performed at four of my children's weddings, and numerous charity and corporate events that I have been involved with. The most recent event was my daughter's wedding and Janis and the Band were phenomenal. They continue to consistently perform and entertain at the highest level. Rave reviews once again from all of our guests and family members!! The Janis Nowlan Band was energetic with great sound and offered a fabulous variety of music to keep the dance floor full for the entire night. What fun! You will not be disappointed if you choose this band. The Janis Nowlan band is phenomenal!! They have performed at many of our family functions over the last nine years. When I got engaged there was no question as to who we wanted to play at the wedding. They are excellent musicians and also really nice people. We will definitely use them for future events and would recommend them to everyone! Wonderful Band everyone was up dancing music played was perfect. Janis was GREAT to work with. Would absolutely recommend!!!! Fantastic talented band! I highly recommend them. We danced the night away at some friends wedding! They were remarkable! As father of the bride, my concern was that guests were able to talk during dinner with good background music & then enjoy a memorable time dancing or listening to good music. The music appealed to all age groups & was done professionally -- exactly what I was looking for. Ray and I thank you for doing what you do best - getting the party started and keeping it going, and for your friendship and kindness to our family. You made my daughter Crista and Ken's day special and one that everyone who attended will always remember. This band was amazing! They played such a great mix of old and new and sounded just like the originals! Awesome time! Awesome wedding! HUGE kuddos to the band! The only words I can use to sum up the atmosphere this band created is... Even the non-dancers couldn't be pulled off the dance floor! Truly a close second to the occasion, but only to my bride. Could not ask for more, from start to finish. Janis Nowlan's Band is so much fun!!! The musicians are very talented professionals but they are engaging artists. They played music that appealed to everyone. I danced for hours!!! That band was fantastic, full of energy, excellent music, it was a blast to all of us ! Loved loved loved this band! We had so much fun at my friends' wedding dancing the night away. I actually had to weigh my options to go off the floor to switch my heels to flats because I wanted to dance to every song they played... Haha! Definitely worth every penny and more-- your reception will be talked about for years to come! I saw the Janis Nowlan Band at my cousin's wedding. The music was great and the band did an amazing job of making everyone WANT to be out on the dance floor. They truly made the event. I'd hire them in a second!! Janis Nowlan Band brings the party to life! Janis brings together the best of the best with gifted talent in JNB musicians and singers – even “non –dancers” couldn’t resist the music and found themselves dancing the night away. Best Wedding Band Ever! They kept the guest on the dance floor all night. Very talented musicians. Never took a break. The Janis Nowlan Band made our wedding. I spent the entire night on the dance floor with my guests. They played the perfect mix of new songs with the classics. The band actually plays all of the music, unlike the other popular wedding bands that play to backing tracks. They more than happy, and excited, to let my brother sing and play our first dance song. They are extremely talented musicians and worth every penny! There was no limit to the range, energy and talent of each member of this terrific group! Every guest at my daughter's wedding stayed on the dance floor till their energy ran out or the band finished! Do not hesitate to book this band!!! My daughter booked it strictly by the on-line reviews and was astounded at how true the reviews were. Janis and her band kept all of our guests on the dance floor the ENTIRE night. In fact, we saw passers-by dancing in the hallway outside the reception room, that's how good the band was. I'd like to think that my bride and I would have made the wedding memorable, but nope - it was definitely the band! I grew up playing music and played through college. It is one of the most important things to me and there was no way I was going to cut corners on my wedding day. There is nothing more influential on the mood of a party than the music. My husband and I heard the Janis Nowlan band on the Internet and it was a no brainier to book them for our fall wedding. The 11 person band did not disappoint! People were raving about the performance. Not only did the party people love dancing to the great variety of music, the non dancers had a blast just watching. Almost like a mini concert. Janis was so easy to work with, took great notes so was plugged in and on top of what we wanted, was on time, and her band was fun and upbeat. You will be totally blown away with Janis and the quality of the performance of the band. It was everything I always wanted! From the moment Janis hits that first note , the only thing your party has to do is enjoy. Without question a great musical experience. All genres of music taste are catered for. I will preface this by saying I am not someone who usually acts on hunches or gut feelings. I usually research the HELL out of things before making a decision, especially when it is a major spend. From the first time I spoke with Janis, I knew she and her band would make our wedding a personalized experience, something unique to me and my husband. We listened to a couple of videos online and read some reviews, but not a lot. And then we went to a showcase. This was the first and last showcase we attended. My now husband and I decided after their first set that the Janis Nowlan Band was the perfect band for our wedding. They are true musicians, not just wedding singers. Every single one of this 11 piece band is magnificent. Janis is both the bandleader and the clerk of the works -- she pays attention to every detail to make sure song requests are honored, the wedding party and parents announced, and the party runs smoothly. In dealing with her in the months, weeks, and days leading up to the wedding, I would have thought that ours was the only wedding on their calendar! Our wedding was just a few weeks ago and the notes from guests are still streaming in -- most of them comment on how amazing the band was! Everyone from age 8 to 85 literally danced from the get-go until the last note. So fun! They truly were a great band- Their songs not only showcased the talents of all the musicians, they played such a nice variety of music that appealed to all ages---and it's hard to appease all ages but these guys managed to do so. My 7 year old nephew was writhing on the dance floor playing air guitar as the real guitarirt was rocking out, while the groom's great aunt felt compelled to start the bunny hop. Having attended a best friend's wedding shortly after we got engaged where Janis Nowlan Band was performing, Zach and I knew we just had to have them at ours! It was our first wedding planning decision! Their band is the real deal and runs deep in instruments! Because of this, they are able to play continuously all night long with the size of their band and are wonderful entertainers! A couple of the members played for our reception cocktail hour, then the full band during dinner with lighter sounds then really turned it up for the dancing after dinner! They know how to gauge a party and keep it going all night. This is the reason why I trusted Janis so much, especially since we love the "oldies" which JNB does SO well but they are just as good, if not better, with the through the ages and newer stuff and depending on the crowd, they know exactly what to play and when. I cannot say enough about JNB's musical talent but what made the planning process and night all the more meaningful was the dedication and passion for excellence that Janis exudes. Her detailed attention and planning for our date made me feel in such good hands and her passion made it all the more fun and exciting!! A friend in London that could not make our wedding in Philadelphia emailed me the week after the wedding saying how amazing she heard the band was and already booked them for her wedding next summer in 2016!! Thank you Janis Nowlan Band for making our wedding celebration all the more sweet and FUN!!! It was our absolute thrill to have the Janis Nowlan Band provide the musical entertainment at yet another one of our family's weddings. The level of energy and professionalism which they bring to an event is surpassed by none! We continue to recommend them on a regular basis, and can't wait for the next opportunity to see them again. Awesome band!!! I was a guest at a wedding that had this band and they were fantastic! Everyone was on the dance floor all night! The Janis Nowlan Band was outstanding!!!! I can't thank them enough for making our wedding the best we could have ever imagined! There wasn't a minute that we weren't out on the dance floor! Our 90 year old grandparents were even out dancing! All our guests wanted to book Janis for their next event! I couldn't be happier with our decision to have them be a part of our day!! Thank you so much Janis and the amazing band!! Janis Nowlan Band is quite simply the best! From our first contact by phone, through the planning phase, to the last dance, Janis was enthusiastic, creative, fun and incredibly talented. She and her band have an extraordinary range and will keep everybody entertained...most highly recommend! Awesome band! We couldn't have asked for a better band to play at our wedding! Willing to learn new songs for us and played such a variety. They did an awesome job at keeping everyone out on the dance floor! We were so happy with our choice to use Janis Nowlan Band! The band was very important to us, and we listened to everyone in the Philadelphia area - Janis was our top choice by a landslide! The dance floor was packed all night, and another friend also already booked the band for her upcoming wedding!! Thank you Janis for making the night so memorable. Best band ever!!! Made my wedding the perfect day! For weeks people kept referring to how much they loved the band and what an awesome energy they had! The Janis Nowlan Band hit it out of the park! The dance floor was full all night - which was exactly what we wanted. And the quality of their performance and sound was second to none. We had multiple friends inquire afterwards for the name of the band - complete hit! On a personal note, Janis was amazing. She really got what we were looking for - a complete range in music genres. Everything from old standards to Motown to some funky 70's/80's thrown in for good measure. Not every band is up to the task, but Janis and her gang of maestros carried it off!!!! And I would book them again in a heartbeat. They even learned two new songs just for us! It meant the world! Thank you Janis! If music is an important element of your celebration and you want ta dynamic band, look no further! Having The Janis Nowlan Band for our wedding was the best decision that we made for our wedding. They were so amazing! They kept everyone dancing all night long and all our guests kept raving about what an amazing band they were. Janis was extremely professional and responsive and really made sure that the band played what we wanted and what would keep everyone dancing all night long. Our first dance was not a well known song but the band played it and it sounded almost exactly like the original. We can't thank Janis and the band enough for making our wedding the party that we only dreamed it would be! I can not say enough good things about Janis Nowlan Band. Janis' attention to detail is unmatched, which helped our day go off without a hitch. The band learned our first dance song, as well as my sorority song and they were perfect. The jazz trio performed at the cocktail hour and set the perfect ambiance. After speeches, they got the party started immediately. They had people up who NEVER dance, myself included, up and dancing the whole night. My dad even got down and did the curly shuffle. Their energy is incredible and they love to include guests in the singing. I received so many compliments on this band and still have people asking me other places they can go see them. At the end of the night, we chanted for one more song and the band complied. It was perfect and I can not thank them enough for making our day exactly how we wanted it...a big party with non-stop dancing. If you want to have a fabulous time, Janis Nowlan Band is without a doubt your choice! Janis and her band delivered everything they promised and more for my daughter's wedding. The guests raved about them and my daughter and her husband were thrilled with their performance. They advertize that they are the best and they lived up to it! Janis Nowlan Band is the BEST in the BUSINESS!!! Have no FEAR Janis Nowlan Band is HERE! I would recommend this band to anyone who knows how to have a good time with great music and dancing. And as the Bride, I never for one moment had any doubts or worries that we picked the right band. They are so good my sister had them at her wedding and my cousin is booking them for his wedding. TWO THUMBS UP! My husband and I saw the Janis Nowlan Band play at a friends wedding a few weeks after we got engaged. We hadn't started planning yet, but he said, "I don't care what else you plan, but we have to have this band!" We very soon after hired the band to play at our reception and a jazz trio to play at cocktail hour. Throughout the entire year of planning, Janis was so easy to work with. She responded to my many emails about how things worked, offered advice, and went above and beyond with accommodating us to make our day perfect. Janis learned three new songs for us to make our day absolutely perfect! She even calmed my fears about doing a choreographed dance with a live band having never heard the song performed by them. Everything went perfectly and our guests (many of them musicians themselves) all were raving about the band! The dance floor never cleared or thinned out. People were dancing all night long! Janis even allowed us to have a special guest performer use her keyboard, which was amazingly generous! We can't say enough great things about this group. If you want a full dance floor all night, this is the band to pick!!!! The Janis Nowlan Band is beyond amazing! My now husband and I recently celebrated our one year wedding anniversary and to this day we still receive rave comments from family and friends on how awesome our band was. Janis and her band made our celebration truly special, fun, and memorable. Look no further for a wedding band!! Janis Nowlan Band was AMAZING!!! I know I'm biased... but my wedding seriously was the BEST and it was mostly due to the band. The energy was high all night and they seriously played non stop dance music. They even included my two new favorite songs... "Shake it off" and "All about that Bass" :) I feel like most bands couldn't pull them off but they sure did!! All of the songs I asked to be included that night were and then they just added their own wonderful suggestions to the mix. I could not be happier about my experience with them. DEFINITELY a MUST for your big day!! This is the best band! The Janis Nowlan Orchestra has been our band of choice for 8 years. Three weddings, special birthday celebrations, and a holiday office party were made more memorable because of this fabulous band. Our son was married on 10/10 and we danced all night to music from many genres. The dance floor was jumping all night long! Janis is the best! We look forward to our next celebration and can't wait to see the band again!! The Best! The Janis Nowlan band played at my wedding in October 2014. This party band is unbelievable. They had a great mix of newer and classic songs that set the tone for the entire wedding. They had everyone - young and old - on the dance floor the entire night. The compliments were overwhelming from our guests – everyone couldn’t rave enough about their energy and incredible sound. Aside from talent, the bandleader, Janis is amazing. She is helpful, patient and goes above and beyond in terms of servicing her clients. She answered all of my (many!) questions and had really great recommendations to make our wedding special and memorable. Her and the band are true professionals – highly, highly recommend! Janis had wonderful ideas and great communication. Her band had everyone dancing the entire night. It's true that the band makes the reception. Janis, I don't know where to start, the band was beyond amazing! Hands down the best decision we made was choosing the Janis Nowland Band to perform at our reception. Janis was so easy to work with and had great communication with us throughout the planning process. Janis and her team are incredibly talented musicians, entertainers, and also extremely professional.They did a phenomenal job keeping the dance floor (in this case sand) packed! Thank you for creating so many great memories for Joey and I and all of our guests! All of our guests said that we had one of the best weddings they had ever been to and a big part of that is because of the fantastic music! The band never stops to take a break and can play any request. I will never forget jumping on stage with my husband to dance to Pharrell's song "Happy"! I even crowd surfed in my wedding dress! Janis and her band kept the party going! Hands down best decision was choosing the Janis Nowlan Band! If I could give more than 5 stars I would! The Janis Nowlan Band was amazing! They were so professional and accommodating. It 's been over a month since my daughter and her husband were married. Guests are still raving about how fantastic the band performed. They really rocked the house. I had the time of my life. The band really helped make the wedding reception one of the best ever. It was a party the bride and groom, friends and family will never forget. The band deserves every award that can be given to a band. They can do it all! Very simply put, I told Janis that my only request was for my guests to dance all night, and they certainly did! I chose the Janis Nowlan Band because I had heard wonderful things about them and they did not disappoint. Janis was so wonderful to work with throughout the planning process. Even though I'm sure she is planning a million weddings at the same time, she goes out of her way to make you feel like her only one. She was so easy to work with. As for the music, it was awesome from start to finish. Everyone was on the dance floor all night. I loved that some of the band members joined us on the dance floor during a few songs. We had so much fun, and it was all because of the Janis Nowlan Band! I will definitely be recommending them to our friends. From start to finish, we had a wonderful experience with the Janis Nowlan Band. Janis did our ceremony music and the entire band performed at our reception. Janis was a complete delight to plan with throughout the entire process - she is very detail-oriented, which made me know that everything would run smoothly on the day of. Our guests came ready to dance and the band really got everyone moving! We are so happy that Janis Nowlan Band was our wedding band and cannot thank Janis and the band enough for helping to make our wedding the best night of our lives! In order to have a party that no one will forget, you need an AMAZING band. This is why we hired Janis Nowlan Band!! Janis Nowlan Band made our wedding one that people will be talking about for years to come! The band's sound and energy is off the charts. We had everyone on the dance floor the WHOLE night! I could not believe that in every photo the photographer took of the dance floor, it was completely filled and you could tell by everyone's faces that they were having an amazing time. Janis, who is the leader of the band, was a pleasure to work with. She is such a nice person, is super experienced, and is intuitive about the direction you want your party to take. If you are looking for an energy-filled party with great music and great singers, don't look anywhere else! My husband and I are so grateful that we chose Janis Nowlan Band for our unforgettable wedding!!! When we first saw Janis Nowlan at the showcase, we were sold right away. She made my daughters wedding a huge success! Our guests were dancing all night! Janis was very easy to work with, and kept in contact with us from the time we booked her, up till the big day. If your looking for an outstanding band, Janis Nowlan is the one for you! Thank you thank you thank you for EVERYtHING you did for us on July 4th to make that night the best night of our lives! Seeing our kids (Carina and Rob) so happy was the thrill of a lifetime. One last favor to ask of you....If you are able and willing, could you forward to me the setlist from that night? Even an approximation would be great. The reason is that I would love to put together a soundtrack of that night. It would be just for our purposes. Our memories are already starting to fade on what songs were played that magical night, and the music was really the glue that held it all together for us. We couldn't have been happier with every single aspect of Rob and Carina's wedding. Her processional that you played brought me to tears....it was so perfect. Perfect - all the way through to the last note of God Bless America! Such a sweet ending. I swear Janis, I will have the Janis Nowlan Band play at every one of my kids weddings if its the last thing I do as a Mom. You are so special. Janis played the keyboard for the ceremony and then the cocktail hour (fabulous jazz music) and the whole band joined her for the reception. They played beautiful classics, like Frank Sinatra, during dinner and then completely exploded into a 5 star party band for dancing. They have an awesome mix of classic and new hits and really know how to get a party started (and keep it going and going). They don't cop-out and let a DJ play the newer songs (like most other bands do) and most of the time, they actually sound BETTER than the originals! I can't say enough of The Janis Nowlan Band! From beginning to end, they were a dream! Our guests STILL talk about how fantastic the band was and how amazed they were at their pure talent. If you, or someone you know is planning a wedding, you HAVE to call The Janis Nowlan Band!! The BEST Band PERIOD. Janis Nowlan and the rest of this FIVE STAR BAND made the wedding of our daughter the NIGHT of OUR LIVES. You don't completely understand until you see and hear them IN PERSON. They are worth every single penny you can scrape up. This is our families wedding band for years to come! The Janis Nolan Band was the best wedding band I have ever heard. They do the best job in the buisness. Friendly, helpful, and great music. Really, really terrific band - the BEST I have EVER heard at a wedding. We've been to several weddings with Janis and her band as the entertainment and all have been thoroughly enjoyable. All the current hits, great standards, special requests - all meticulously performed with great energy and style. I have been to so many weddings recently and Janis and her band were by far the best of them all! Janis was so easy to work with and was able to accommodate all our song requests! The dance floor was so crowded people were dancing on the grass of our outdoor tent wedding! The variety of songs her band can play is remarkable and it was a great mix for both the younger and older crowd. I would recommend Janis and her band to anyone! I may be biased but I think the Janis Nowlan band is by far the best wedding band I have ever seen. Guests were on the dance floor all night and raved about how much energy the band brought to the party. They were so good that band members from another renowned band playing at a different wedding stopped by to hear them play! I highly recommend Janis Nowlan to anyone who wants a classy but FUN wedding reception. In fact, one of my bridesmaids has already booked them for her wedding! Thank you for making the night such a huge success Janis & crew! Janis was AMAZING. She was extremely professional and accommodating. We hated to see the evening end. Janis did a wonderful job at our wedding - our guests didn't stop dancing! She was always so willing to help us - from crafting an entrance song, to learning the song we wanted to end our night with! Janis performed at my sisters wedding in 2007 and was amazing. The day after I got engaged I contacted Janis to be sure that whatever date we picked would work for her and her band because she makes any wedding the best it can be. I cannot thank Janis and her band enough for giving us the best day ever! Janis and her band were absolutely fantastic. My wife and I booked Janis the day after we got engaged. The band performed at both of our sisters' weddings and she was the first phone call we made. Janis was extremely responsive and had wonderful suggestions for the event. She was willing to spend any amount of time necessary talking to us to make sure she knew what we wanted. If you get married in the area you must use the Janis Nowlan Band. The best wedding band I ever heard. Had everyone dancing all night and then some! Worth every cent! There are some reviews that give 5 stars to bands for showing up on time and playing recognizable music. This review is not one of those. Janis Nowlan and her band are simply superb. She had the entire party dancing from start to finish with a great mix of old and new songs. With barely any recommendations, Janis ran the whole night by herself and even adjusted to the songs that got most people dancing. She is a wonderful person to work with and even worked with the best men to sing an introduction to the first dance - and idea that was created less than a week before the wedding. If you hire Janis, you don't just get a great band, you get the assurance that your friends and family will remark on how great your band was for years to come. P.S. We hire Janis for three Bar Mitzvahs 10 years ago and hired her again because she was so fantastic. have had the privilege of attending two events (a gala event for our hospital and another wedding) where Janis's band played. Without hesitation, the 1st vendor we booked for our own wedding this past May 10th was Janis's band. The band truly made our reception rock! The band's ability to cater to all age groups meant our dance floor was used all night... not an easy feat given the guests ranged from 10 to 74+. I cannot say enough how happy we were to dance with family and friends while hearing the band's endless talent with their horns, drums, bongos, guitars and piano .. .not to mention the soulful sounds their singers brought to every song. Janis herself is the epitome of a consummate professional. She was awesome in helping us finalize our song list but equally adept at changing on the fly (much to our appreciation) as she saw what the guests were responding to the most. Personally, while I dealt with a last minute change (my father wasn't healthy enough to attend the wedding), Janis's compassion in handling that situation, especially as it related to the father/daughter dance was extremely appreciated. To this day, we continue to receive rave reviews from our guests regarding how awesome the band was and how much they enjoyed themselves more than any other wedding they had been to. I would never hesitate to recommend Janis and her band to anyone. My only hope is I can find another event in our own family's future to hire her again. In my opinion and that of our 210 guests, this is best band that they or we have ever heard. This was our SECOND TIME using Janis and her 12 member band. Yes, 12. The first time was in March 1999 for our eldest daughter, and ever since that wedding, our guests have said that they still have never heard a more talented group of musicians and vocalists than Janis's in 1999. Therefore for our second daughter's wedding in Nov 2013, there was no doubt that we wanted to have her play again! Our guests were thrilled to be treated to a second "concert" by the Janis Nowlan Orchestra! YES, they wowed everyone, and there was not one moment without her magical mixture of music from beginning to end! Her forte is her extensive repertoire of songs! Janis is a true professional, courteous, and well-organized. She is flexible and listens closely to what your desires are! She is a wonderful emcee as well. She cares sincerely about every bride and groom and the wedding guests. This isn't just a "gig" for her. She loves what she does, and her joy and excitement as well as that of the band is ever present!! She is a lovely, lovely person. She sings herself and plays the piano. you were at a concert! Our guests enjoyed a full night of dancing! I have already told Janis that when our last child gets married, she has to return again!! Janis Nowlan Band MADE our wedding. 14 years ago they played for my sister's wedding and 14 years later people are still talking about it. That was the band my now husband and I wanted, and now our guests are and will be talking about Janis's band for years to come! They were the first band we went to listen to and they were the last band we came back to. By far THE best wedding band you could ever have! My husband and I are deeply vested into music and we wanted a band that would knock the socks off of our family and friends. Janis Nowlan came with 200% energy, and ended the party with the same! They are extremely talented musicians and vocalists and played non-stop, keeping the dance floor alive and packed the entire night. They learned our wedding song that 99% of our guests did not know, an 'indie' song, and nailed it spot-on. Several of our friends came up to us noting how beautifully played it was!! We could not have asked for a better, more energetic, more talented, and awesome band to play for our wedding day! If you haven't checked them out, you are missing out. Thank you Janis Nowlan Band for everything you did to make our day THE BEST EVER!!! For someone who said the number one thing that he was looking forward to at the wedding reception was the band, the fact that the Janis Nowlan Band met and exceeded my expectations says big things about them. The band not only learned our wedding song, but they rocked it. They hit every song we threw at them, keeping the energy of the night at the right level every time. As a music critic, I couldn't have been more happy, with every instrument coming across clean. My mom and I did "Moon River" for our song and it will be something we will have to cherish forever. Thank you Janis and band!!! Words cannot express how amazing Janis Nowlan Band is. The music was such a hit at our wedding and all of our guests are still talking about it! Their energy and talent had everyone on the dance floor all night. Janis is so wonderful to work with. She gave me great suggestions for entrance songs and her band learned the song we wanted as our first dance song. It came out perfect- I could not have asked for better! I highly recommend Janis Nowlan Band! They make your wedding day extra special. I cannot thank them enough for making our wedding day so special! I cannot say enough great things about Janis Nowlan Band. They were absolutely fantastic! The music was such a hit at our wedding. Every time someone commented on how much fun they had at our wedding, they mentioned how great the band was. This band can play practically anything. We liked a mix of new and old music. They were able to go back and forth between both with no problem at all. I provided a lot of suggestions of what kind of music my family like, and they created a set list that had everyone dancing all night long. I didn't even need to provide that many selections. I just told Janis a few of my favorites and she knew exactly the kind of party we expected. Also, they don't sound like an ordinary wedding band. They're voices are great and the musicians are awesome. The sound that was coming out of them was unbelievable. I was impressed with some of the more current dance music they were even able to pull off. When picking out our special songs, Janis was a big help. I didn't have anything picked out besides our first dance and she was great at providing suggestions for introductions, parent dances, cake cutting, everything. It saved me a lot of time and her suggestions were perfect. Everyone was non-stop dancing from the moment the party started until the party ended. I would love to relive the whole thing so I could dance and listen to the music again. Janis Nowlan Band was one of the highlights of our wedding. All I cared about was good food and great music. Well they definitely fulfilled the great music criteria. They are pricey, like most bands, but totally worth the splurge. If you splurge on anything, get this band! They are totally worth it!! Awesome energy, kept everyone on the dance floor the ENTIRE night, large catalog of songs, willing to learn new songs, Janis does an awesome job of MCing the event. Several friends have asked about the band because of their time at our wedding. THANK you Janis and team for an amazing night we had a blast and so did all our guests!!! Janis Nowlan Band was great! We decided to have them for our wedding after seeing them at another and they were awesome both times! This wedding band is the premier band in the business. We had the Janis Nowlan Band for both our children's wedding -- even crossed the line between Philadelphia and New York to make these events happen! It may be the only two things Philly and New York agree on -- Janis Nowlan Orchestra rocks ! Our guests were up dancing having a fabulous time the entire wedding! This band is so fun!! Janis is simply magnificent so professoional, reliable and amazingly talented! She and her band put on a great party! Our wedding was the best night of our life and all the thanks to Janis Nowlan Band for the entertainment of a lifetime! With the help she helped us plan a special first dance and she and my husband planned a very special secert surprise with my husband singing with the band to me, he blew all 200 people away!!!! She will deliver always a top notch five star performance!!!! Everyone will be out of their seats the whole night having the time of their life, you can't go Wrong the Janis Nowlan Band!! There was not a space open on the dance floor. 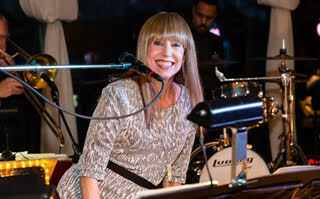 Janis Nowlan Band delivered a top-notch dance party experience at my wedding this past June. My guests are still talking about how fantastic the band was. Janis was great to work with and kept in touch in the months leading up to my wedding to make sure all of my requests were met and questions were answered. Janis and her band were very accommodating and even put together a specially requested mash-up of a song for the Mother of the Groom/Groom dance. The band paid attention to the vibe from the crowd and played non-stop the whole night keeping the party going. Having 11+ members including horns, bongo drums and 3 fabulous front singers made the songs sound amazing. I would highly recommend Janis Nowlan Band for any event. If you want a dance party, this band is the band for you! BEST BAND EVER! High energy, great music! Janis Nowlan Band is hands down the BEST band out there! They were absolutely fabulous from start to finish! They had everyone dancing ALL night with quality great music and never took any breaks! Janis was extremely helpful and detailed- from learning everyone's names, learning special songs for us and reviewing all of my timelines! She and her entire band are true professionals! If you're looking for great music for your event, you must check out Janis Nowlan Band. They will not disappoint you. We hired this band for our daughter's wedding and they were awesome. Janis listened to our requests and needs. Everything we asked for, she delivered. The band played non-stop and they had everyone up on the dance floor all night long. Now that's a sign of a great band. The members of this band are so talented. Friends and family are still talking about this wedding and how much they loved the music. Don't waste your time running around checking other bands and DJ's. Hands down, this band is the best. I wish I could give them more than 5 stars. That's how much I loved their music! Janis Nowlan Band is the most amazing band to host an event. They are true professionals and the nicest people to work with that I have ever met. The performance was unbelievable. I never had to worry about a thing my entire wedding night. All 200 guests were up and having an absolute blast. Everyone is still raving about the Janis Nowlan Band. The music and performance was truly the best there is. No other band comes close. Look no further, you want to book this band. Janis and her band were wonderful!!! Janice was so organized and so excited for us from the very beginning. She went over everything with our planner to make sure they were on top of everything and the timing would work out. The jazz trio at cocktail hour was perfect and exactly what were hoping for. The band for the rest of the night was wonderful!!! They got every person at our wedding on the dance floor for the entire night! they kept that party going for hours and were amazing! Everyone loved them and we couldn't have been happier!!! I wanted to save money and hire a DJ, but my husband was adamant about hiring a band...I am so glad I listened to him! The Janis Nowland Band was incredible!!!!!!!!! They have this unbelievable power to get everyone on the dance floor. Friends that I have never seen dance before were strutting their stuff all night long!!! We sent Janis a list of songs that we liked, and she put them into the perfect order to dance to at the reception. They have an extensive list of songs that they play on their website, but Janis assured us that if there was a song we wanted that was not on their list, the band will take the time to learn it...I thought that was the greatest thing!!!!! The entire band was a pleasure to work with! Considering hiring the Janis Nowlan Band? There is absolutely no need to think about this decision any further. The band is absolutely phenomenal and Janis is incredibly personable, talented, organized, easy to work with, & will listen to your ideas & execute every single one to perfection. She takes the time to ensure she has every pronunciation perfectly and every song and request written in her notes. She is the type of person who has a deep passion for what she does and takes the time to deliver only the highest quality in every aspect of what she does. Did I mention that our guests didn't stop dancing the whole night? There is a reason this band has won the awards they have. There is a reason they are fully booked nearly every weekend. They are extraordinarily talented and they deliver exactly what they say they will and then some. Hire the Janis Nowlan Band - you (& your guests!) will be thrilled that you did. Terrific! They are the best! The band people are so talented. Amazing band! Made my son's wedding! Never been to a wedding where everyone danced the whole time! The band took no breaks, one song just flowed into another. The sound, the musicians, the singers everyone was amazing!! Janis and her band made this event more then the formal wedding one thinks about when they think of a wedding. NOBODY left the venue until the band shut down. The best wedding ever. Thank you Janis!! I highly recommend the Janis Nowlan Band for a wedding. We first heard the Janis Nowlan Band at my sister's wedding and they were outstanding! We loved them so much that we hired them for our wedding. We got married about 2 weeks ago and it was a great party! The band is absolutely fabulous and kept all of our guests entertained for the entire night. The band knows how to get everyone on the dance floor and keep them there all night! Janis is very accommodating and worked closely with me to perfect the ceremony music and create a timeline of events for the reception. Our wedding would not have been the same with out the Janis Nowlan Band and we look forward to seeing them play again soon at our friend's weddings! The Janis Nowlan Band is the FIRST band to consider for your function. So, for our daughter's wedding they were "simply the best". Janis takes such an interest in the people with whom she is working that we felt very comfortable requesting special music for the ceremony. Her band not only delivered but exceeded our expectations. I was duly impressed with the professional ethic of the musicians and their commitment to excellence. Whether it was the instrumentalist or the vocalist, the performance was seriously undertaken and extremely well delivered. From the prelude for the ceremony, through the cocktail hour and long into the night, the music of The Janis Nowlan Band was the right choice. When our guests do not sit down and the band members are smiling after working straight thru the evening, then you know that all were pleased, as was I, with the fun and joy expressed through the music. I don't even know how I can put into words how AMAZING Janis and the band were for our wedding! Janis is professional, efficient, and most importantly fun! She listens to what you have to say but also gives her opinion on options...and believe me, you should go with what she says! She knows what she is doing...her suggestions for song choices and timelines were spot on! I still have guests calling about THE BAND!!! and even some of the specific songs! Literally our entire crowd was dancing all night long. Each singer and band member were just so perfect...and looked like they were having fun right with us! We are beyond thankful...our wedding was perfect much in part to them...they kept everything going. And I will NEVER forget our first dance song! The band is fabulous! We have had nothing but compliments. Janis is a pleasure to work with (as is her band) and played the songs we requested and, just as important, didn't play the songs that we put on our "Do Not Play List". I highly recommend her. They can play a wide range of music, sure to please any taste. Janis's band is quite professional. Tremendous singers.Can perform any choice of music that is desired. She's also quite responsive to the want and do not want lists. The singers actually come down off the stage and get the audience involved and out on the dance floor. If you're looking for a great band that can play most anything for your affair, this would be the one. We had the Janis Nowlan band at our wedding in May 2013, and loved them!! First, I highly recommend going to see one of their showcases. Throughout the crazyness of the wedding planning process, knowing that I had a fantastic band booked, and that people couldn't possibly not have a good time at a wedding with a band this good, kept me going! Janis was wonderful to work with, very fast to return phone calls and emails. When trying to pick the music for my ceremony, she put her phone on speaker and played songs for me on her piano, so helpful! And yes, at the wedding, the band was a HUGE hit!! The music was great, event he people who admitted to not being dancers told me how much they enjoyed it! They were fantastic to dance to, I only wish I could have had more time on the dance floor! Because the band has many singers, they can do wide range of music styles, and I think this mix is partly what keeps the party going! Loved everything about the band, and Janis herself! This band brought the party. Janis was very responsive and had several lengthy conversations with my husband to ensure that every detail was covered and that she knew exactly what we were looking for. She surprised both of us and learned new songs that we discussed and that she knew we would appreciate. She was flexible as our cocktail hour ended earlier than planned and she accommodated the change in plans. The energy and enthusiasm that Janis and her band brought created a very memorable experience. Janis Nowlan Band is seriously the best band out there. We went to a ton of showcases and as soon as they started playing, we knew they were the band for us! On our wedding day, JNB had guests of all ages dancing from the beginning of the reception and BEGGING for more by the end! This band is BAR NONE. There's no one else like them out there! Guests are still raving about them months after! I just had my wedding 12/1/12, and was given the name Janis Nolan Band from my sister who was suppose to have them at her wedding too! After contacting Janis, we took both sets of parents and went to their showcase....WOW, we were all blown away, the entire band is phenomenal! Janis previously said that our date was under question with another couple, Well, we weren't letting the life of the party slip away! We gave our deposit and locked in with what we knew was going to be the backbone of our wedding! Speaking with Janis over the next few months, she is extremely courteous, professional and has your best interests at heart! She kept telling me, "it's your day!". The week before the wedding talking to Janis we set up a timeline and she made everything run so smooth, she knew we wanted a party and a party we got!! I never really left the dance floor the entire night, but the amazing part, neither did most of the wedding! There were slight mishaps at the venue the day of the wedding, but no one had a single clue because we had The Janis Nolan Band entertaining our guests from the minute they walked in the door. Hands down the best part of my wedding, people were asking me the night of the wedding and are continually asking who was that band?? The Janis Nolan Band!! thank you for an amazing wedding night!! Cheers to the Janis Nowlan Band for keeping my guests on their feet the entire time! What an amazing band! Janis was easy to talk to and very thorough when it came to planning the night, which makes any bride feel better! My husband and I really appreciate that they took the time to learn our wedding song too. That meant so much to us. We can't wait to go to another wedding where the Janis Nowlan Band is performing!! Our daughter was married on 11/3/12 and the Janis Nowlan Band was unbelievable!!! I dont think there is much I can add to all of the other reviews, but I can tell you that they are the BEST BAND EVER! They played during our cocktail hour and we even had them extened after the 5 hour non stop dancing reception!!! Janis is just an awesome person and did a fabulous job leading the evening. The band is beyond compare. They know how to read the crowd and they even dug up a 29 year old song for my husband and I that we had at our wedding. Each and every member of the band is more than talented and it is so obvious how much they love what they do! Thank you Janis Nowlan Band for making our daughters wedding the most memorable evening every. I would like to add that Janis has a very special way about her. She makes you feel like you are the only event they have all year. She has an awesome personality and she is extremely responisive and she follows up. I felt that she was in control and on top of everthing at all times. After the reception she even stayed and hung out with us for a while in the hotel lobby. It was a magical evening. Absolute perfection! We had such a great time, all 200 guests were on the dance floor the entire time. Janis listens to every detail and it was like having an old friend perform at an intimate family event. We gave her complete freedom just because of what everyone said about her! They are so professional, from the minute we contacted her, the contract, the playlist, information on watching her perform before your event, her web page, returning phone calls, emails, set-up, etc. When the "business" side is so well handled by Janis personally, you trust her completely. The music was even better than the band's reputation, and by the end of the evening, we felt like she was a member of the family. I have done nothing today except answer the phone and listen to compliments about our wedding band. Once again, PERFECTION! All the dancing you can handle! Janis Nowland band will keep you going with their amazing play list and awesome sound. Every song sounds like the original. All I can say is pick songs with horns because you will not be disappointed. Very professional and detail oriented which made our night easy and special. Highly recommend this band even if the budget is tight. You won't regret it after your guests tell you what an amazing time they had. Having the Janis Nowlan Band perform at our cocktail hour and ceremony was one of the best decisions we've ever made! They did an amazing job keeping everyone on the dance floor and also keeping the energy up during the flow of events (cake cutting, first dances, toasts, etc). We had so many wedding guests tell us how much they loved the band. We would definitely recommend them to anyone who is looking for an energetic and versatile band for their special day! The Janis Nowlan Orchestra was absolutely fantastic. Everyone danced and all of our guests commented on how great the music was. Janis is a dream to work with- had great suggestions and totally flexible- goes with the flow of the evening. I would recommend her to anyone and everyone! The Janis Nowland Band is an awesome band! From the moment they started playing after dinner everyone was on there feet. It was a GREAT party, and everyone was raving at how awesome they were. I didn't give Janis a lot of direction on what to play/not to play because I knew she had done this a million times...I am SO glad I let her take charge bc she really knows what to play to get people dancing, and she goes off the vibe of the party. She did a nice mix of old classics and new songs. Janis was also great to work with, she gives you the individual attention you need without being overbearing; she gave great direction and feedback throughout the planning stages. They also learned our first dance song and played it flawlessly, and I don't think it's that easy of a song to learn (Old Crow Medicine Show, Wagon Wheel). Overall it was a fantastic night in large part thanks to a fabulous dance party lead by the Janis Nowland Band. You can't go wrong with them! They played all night. The dance floor was packed. They did a great job. The Janis Nowlan Band is by far the best band in the Philadelphia area. Everyone at our wedding was on the dance floor the ENTIRE night. People are STILL talking about how wonderful they were! Janis was so professional throughout the entire process...from keeping in touch with us months before the wedding to calling us personally to set up a playlist. We could not have been happier with the choice we made. When my now husband and I started prioritizing our wish list for our dream wedding, we decided that our biggest splurge would be a band. We checked out several bands, but instantly loved the vibe of Janis's band and how they were able to play any genre of music and sound just like the original artist (and, in many cases, much better). I cannot tell you the extent to which the Janis Nowlan Band blew us away on our big day on 9/2/12. I did not know exactly what to expect, but from the very first song to the last note of the night, Janis and her tremendous musicians were spot on! They even learned one of my favorite songs ("Lovely Day" by Bill Withers) and surprised me with it during the reception. My husband has two kids--10 and 8--and Janis brought them up to sing an adorable rendition of "Call Me Maybe." The entire band also played "Happy Birthday" to our other junior bridesmaid, who was celebrating the big 1-0 that day. Janis played EVERYTHING--Motown, Jazz, Pop, Rock, Rat Pack, even some Honky Tonk! At the breakfast the morning after the wedding, all anyone could talk about was the band. My Uncle, who was not supposed to dance per his doctor's instructions, said he just couldn't help it! Another guest told me that it was like going to a wedding and then being invited to attend an amazing concert immediately after. I simply cannot say enough about Janis as a person, either. She is warm, wonderful and obviously passionate about what she does. Anyway, this is a long-winded way of saying, "If you're looking for a great band to make your wedding the blow-out party you've always imagined, DO NOT HESITATE--book Janis YESTERDAY!!" You will not regret it!! P.S.--Janis also did our ceremony music, which consisted of Beatles instrumental on piano, and she did an AMAZING job. If you are looking for a ceremony musician and hire her band, make your life easier and hire Janis for the ceremony, too! Janis Nowlan was an amazing band leader to deal with. She made planning the music for our reception as easy as possible. She is always positive, upbeat, and very reassuring. I can't say enough about her personally. The Janis Nowlan Band as a whole was unbelievable!! Everyone at our reception was up and dancing before my husband and I could finish rounding at all the tables (before dinner was cleared)! People will not stop talking about how great the band was and how amazing of a time they had. When I tell you everyone was up dancing, I really mean everyone. My 87 year old grandfather, to my 16 year old cousin! And they both raved about how great the band played. I have nothing but praise for Janis and the Janis Nowlan Band. Seven years ago, we heard her at a wedding on Long Island and knew then that if we could, we would have her at our daughter's wedding someday. They were then and are now an amazing group of musicians....able to play so many different genres of music well. We had light jazz for cocktails, soft music during dinner and all the dance favorites old and new to dance the night away.....with NO BREAKS. They truly played to the crowd and the crowd loved them! Janis is a genuine and lovely person and a pleasure to work with. She was so reassuring with our bride who was nervous about the First Dance. She spent time on the phone on more than one occasion giving her songs and ideas to try. We will definitely have her back for our younger daughter! You can rest assure and have no regrets with the Janis Nowlan Band! Some say the band makes a wedding... Janis and her band never took a break ...the dancing never stopped...they played to the crowd and the crowd loved them. We saw Janis Nowlan Band three years ago at a friend's wedding and knew right then that we wanted them to play our daughetr's wedding if she ever got engaged. Well she got engaged December 2011 and the first thing we did after admiring the ring was call Janis. She invited our daughter and friends to see them play a New Years party that was fabulous. Our daughter and her fiance' were absolutely convinced! Well Janis exceeded our expectations. She stayed in constant contact with our daughter and us up to the wedding day. She even found us a string quartet with only 2 weeks notice when our church singer cancelled! The wedding reception was fabulous. Janis never stopped playing and the dance floor was never empty. Everyone was amazed with the performance. Without a doubt, if you want a top notch reception or party, Janis Nowlan should be the first call you make. This band is worth EVERY PENNY. Not only were they fantastic the night of...but Janis was fantastic since the day I made contact with her. She helped me plan the reception, she helped me get things in order, she even helped me when I had a crisis and had her friend help us out! THIS is the band to have if you want people to remember your wedding for FAR MORE than your dress, the food etc. They will be talking about how much fun they had...and that's the important thing, isn't it?!. I can't recommend Janis Nowlan Band enough. Make room for them in your budget...they are worth it! The Janis Nowlan Band performed at my wedding this past summer and they were absolutely amazing! Janis is so sweet and easy to work with...she was so patient and helpful throughout the whole planning process! Up until the last minute, she was there to answer any questions we had about the flow of the evening. I would recommend her and her band to any bride! To sum it up....encore please! From the first moments a daughter is born a mother starts dreaming of a fairy tale wedding for her. My dreams for my daughter Faith were no different. However, Faith's father, sadly, was diagnosed at such a young age with brain cancer. At age 11 both Faith and her father planned her wedding day since he knew he wouldn't be alive to make it to the momentus event. They planned who would walk Faith down the aisle, what type of gown she would wear, and the reception and music. Thanks to Janis Nowlan, and her amazingly talented orchestra, all our dreams have come true. Janis, immediately from the first time we spoke, made Faith and our family's needs a priority. Faith's groom, and his family, are Russian Jews. His family had traditional music that they wished would be played during the ceremony. Janis, and her band, took it upon themselves to learn the music and words. Between the traditional Jewish music, the Russian music, and the top 40 hits, plus the romantic standards, nothing was left out and basically no one sat down. All were celebrating and dancing the entire night, rejoicing in the moment. Janis made sure to play every single request that Faith and Arthur, and the parents of the bride and groom, requested, every one of them. Janis, and her band members, also came down from their stage and joined the celebration by singing with the crowd in the middle of the dance floor. Not only did different band members sing personally to different guests in the crowd they also had us all join in by singing with them. From the moment we first spoke Janis was always polite, respectful, professional and made us feel special, she created a magical evening of music tailored to our every needs. Janis, and her band members, were dressed for the occasion, very beautiful and very elegant. They arrived early and stayed late. When Janis played "Somewhere Over the Rainbow" as Faith’s step father and I escorted Faith down the aisle there wasn't a dry eye in the room. The Janis Nowlan band was SIMPLY AWESOME!! I was married last year and it was the best decision we made. My husband wanted a DJ because he was not a fan of "cover bands" but he was so surprised and thrilled we went with the Janis Nowlan band instead! We had 200 guests and every single one of them was up dancing. After 5 hours of music, we had guests screaming for an encore! We are still receiving compliments almost a year later! A common example of what we hear "We've been to a lot of weddings with a lot of bands, NOT ONE even comes close to the band at your wedding!" They do ALL genres of music and do every song perfect! We also had Tony from the band play the trumpet at the church and was incredible! Janis was amazing to work with. So kind, sincere and easy to talk to with a suggestion or solution for everything. She made us feel we were the only event she was planning. She is truly a genuine, musically gifted woman that we were honored to have the chance to work with. If you want a classy, professional, extremely talented band who is the best in the business...then book the Janis Nowlan band and you'll have no regrets!! We highly recommend the Janis Nowlan band to anyone getting married! Our guests have not stopped talking about them since our wedding June 2nd. I don't think a single guest left the dance floor the entire night. In addition, Janis was extremely accommodating throughout the planning process. She helped me decide on music and offered great suggestions for the ceremony music etc. This band knows what they are doing and are beyond talented! Thank you Janis nowlan band for making our wedding unforgettable to not only us but to every guest attending ! Janis Nowlan Band is the BEST choice we made for our wedding!!! They made our wedding amazing!! We heard them play at our friends wedding and as soon as we started planning our own- we thought of Janis! From the first time I called her and throughout the wedding planning, Janis was sooo easy to talk to, so understanding and SO helpful. She really listened to me and my husband and her and her band made great choices for our day! The band played for our ceremony, cocktail hour and reception and we have gotten SO many compliments on how great our band was. Janis Nowlan Band learned our first dance and made it unforgettable for us. Janis learned the bridal parties names and went over it with me multiple times to make sure everything was perfect! From the youngest person at our wedding to the oldest, EVERYONE was on the dance floor!!! Janis Nowlan Band is the best! Loved, Loved, Loved them!!!! They made my wedding even better.....my guests never stopped dancing and they haven't stopped talking about them yet!! As the bride, I never left the dance floor.....they helped make my night unforgettable!! This is the most amzing band. The crowd was on the dance floor the entire night. The versatility of the music is amazing. What a great professional band to work with! Obviously, these guys sound great. I specifically hired them because a girl needs a full horn section for Springsteen, and dancing to "Born to Run" with my father is one of my favorite memories from my wedding. But what was extraordinary was Janis' counsel. I initially refused to have Adele's "Rolling in the Deep" played at my wedding (I thought the "lost love" theme was too much of a downer for a wedding). Janis politely suggested that I not completely write the song off because she knew - as an expert on the subject - that crowds were going wild for that song. I reluctantly caved, but when they started playing that song, I got so excited and so did all my guests. My husband and best man turned it into a "dance off" and I can now not imagine my wedding without that memory. Thanks to Janis for being the expert I hired and leading me in the right direction. Yeah, they rocked. There is a reason they are rated #1 in the region. I got what I wanted, and the dancing was awesome as a result.. We had an uncle who asked to play a CD so he could don his Elvis impersonation and it worked. They learned a traditional Korean song for us, and polished up a song they hadn't done in years so we could close out w/ father of the bride singng his favorite song. Many people exclaimed how good they were, and how much fun it was. They did piano for the cocktail hour, and then music through dinner, for the first dance, Introduced us the way we wanted, everything was great. They say if the band is outstanding the party will be memorable. I know people had more fun at our wedding than they had ever had at a wedding, ever. Holy cow... best wedding band out there! I couldn't even count how many people came up to me or my husband at the wedding or for weeks after asking me about Janis and her band. They all couldn't stop saying how we had "the best wedding band they've ever seen!" and I couldn't agree more. From day 1, Janis was professional, helpful, responsive, and enthusiastic. You will struggle to find someone who loves their job more than she does. We had an amazing time at our wedding and a big piece of that was the fact that everyone was out there on the floor dancing. I would recommend Janis Nowlan Band to anyone - best use of your wedding budget by far!!! Janis Nowlan and her band made my daughter's wedding. Everyone had fabulous time and the dancing and energy that was created by her band lead to an evening of none stop dancing. She was very professional to deal with and welcome all my ideas and thoughts for the entertainment. She was all about making the bride and groom's day as special and perfect as they expected. She's a must to hire for a guaranteed great time and memorable occasion. BEST BAND EVER! MADE OUR DAY SO SPECIAL!! My (now) husband said that the band needed to be our top priority, since the band makes the party. Because of that, we splurged on Janis Nowlan Band and we are so glad we did! Janis was very easy to work with and responsive to all of our questions and requests. Whenever we hesitated or weren't sure about a song, she had great suggestions. At our wedding, the music was wonderful and the crowd never stopped dancing. Even a few months after the wedding, we receive compliments from friends and relatives. The Janis Nowlan Band performed at my wedding this summer, and they were truly unbelievable! Everyone was on the dance floor the entire night--- they followed my requested play list, played an amazing variety of music, and everyone sounded soooo great! We received a ton of compliments from our family & friends, and continue to do so a few months later. If you are looking for a high energy, yet classy, band, look no further! And Janis herself is truly a pleasure to work with--- such a nice lady. One of the best decisions we made while wedding planning was booking the Janis Nowlan Band. Their energy, talent, and fantastic personalities made our wedding! The compliments from our guests regarding the music and the energy of the band are still coming even after the wedding! Janis was incredibly helpful in answering our questions and providing guidance and feedback about music selection during our planning process. We worked together to create a playlist that complimented the flow of the wedding perfectly! The band even learned a specific version of my father-daughter dance song so that it was everything we wanted! Janis and her band members are truly one-of-a-kind, talented, and beautiful people inside and out. The Janis Nowlan Band absolutely MADE our wedding! The guests were on their feet the entire night! Janis and the crew were fabulous, they knew exactly what to play, when- They involved the crowd and were super energetic! We keep getting calls from our guests saying that they have never heard such a great band at a wedding! Thank you so much Janis! We will always remember you!!!! Totally awesome band. The reception was a blast. Guests loved the band. Can't wait to have more events with the Janis Nowlan Band! Awesome high energy wedding band! Janis is very responsive and great to work with. Highly recommended for non stop dancing and an unforgettable wedding. As soon as we heard their showcase we knew we had to have them at our wedding! Every member of the band has incredible energy and no one is more passionate about what they do than Janis. She worked around our schedule during the planning process and listened to all of our needs. When it came to the big day we really couldn't have asked for more. The energy was great and the band knew exactly what to play to keep everyone on the floor. They really made the party special. Our guests are still telling us how amazing the band was!! We cannot say enough about the value that Janis and the band brought to our wedding celebration. They played nonstop and the interaction with our guests was wonderful. We had a somewhat casual but very elegant event that was top notch in every way. However, our guests are still talking about the band and hoping we will have an anniversary party every year with the Janis Nowlan Band providing the entertainment. We were very lucky to have been able to book Janis and would not have changed a thing about their performance. Our expectations were exceded. The Janis Nowlan Band is simply the best! I have attended many weddings/other events and they are the best I have ever heard. I knew from the minute I attended their open showcase that I had to have them play at the wedding! As soon as I saw them play I stopped looking for other bands immediately!! They made my wedding and had people dancing the entire night. Everyone is still telling me how great the band was!! Not only are they great performers but Janis is super nice and extremely responsive. I would recommend them to anyone! The Janis Nowlan Band set the tone for the entire night of my wedding. I can't remember a time throughout the whole night that the dance floor wasn't packed. My guests had an absolute blast and all of the band were so friendly and accommodating. The band members were interactive with all of my guests and they all made it so much fun for everyone. The Janis Nowlan Band went above and beyond to give us the most incredibly fun night of our lives. There was not a single song that they left out as far as what I had hoped for and more. They have such an amazing energy about them. Our guests did not want the night to end and in fact, we asked Janis and the Band to stay two hours overtime b/c they are that good. They were hands-down the most phenomenal band ever to work with and to get to know. They are THE BEST!!! The Janis Nowlan Band is absolutely amazing. I clicked with Janis from the moment I first spoke with her on the phone, and we decided to sign her band before even seeing them live. After seeing them perform at a showcase, we knew we had made the right decision! From ceremony to reception, Janis and her band far exceeded our expectations. People young and old were on the dance floor all night, and after the last song people were chanting - ONE MORE SONG! No one, including us, wanted the night to end! Stop reading this and go book the Janis Nowlan Band, you will not regret it! Janis Nowlan Band's performance was absolutely amazing at our wedding. Our guests danced all night long, and have given us nothing but compliments on the band! Janis is wonderful to work with, and she and the entire band are true professionals. This band ROCKS and is so much FUN! Wonderful to work with. Amazingly talented group of professional and fun people. The dance floor was packed all night long with friends and family singing and dancing together. No one wanted the party to end. Would highly recomend. You will not be dissappointed. The Janis Nowlan Band performed at our wedding on 9/25/2010 and to say that they are amazing is an understatement. From the time we saw their showcase to the day of the wedding (a year later), Janis was in constant contact with us regarding timing, song choices, and the overall tone we wanted to set for our reception. The day of the wedding, the band ROCKED! We had a blast and our guests didn't want the night to end! Chants of "one more song" started immediately! Everyone in the band is so talented, they play a huge range of songs, and they are very professional from start to finish. They performed our wedding song beautifully and also accommodated several special requests. I would fully recommend the Janis Nowlan Band to anyone who wants to dance all night at their wedding! Thank you!! Our wedding reception was held at our home and started with cocktails and hors d'oeuvres, followed by a sit down dinner for 220+ in a tent in the backyard with a stage and dancefloor. Janis played standards on the grand piano during the cocktail hour and then the entire band started up in the tent and played beautifully. We had preselected our favorite songs from their extensive playlist, but they managed the sequence nicely so that people could enjoy their dinner and also dance a lot. And they never took a break! The entire event was top-notch, but the first comment about our wedding that everyone has been making when we see them is "that is the best band I've ever heard at a wedding". I love the Janis Nowlan Band (even if I am annoyed that WeddingWire defaults to a man & woman icon to show "marriage")!!! I saw them at the Union League for a Gala event, which was amazing. Then I hired them for a gay wedding I coordinated. I swear, the dance floor was never empty at the wedding! People were even dancing outside the tent because there wasn't enough room on the dance floor! And the coolest thing was, Janis read the crowd and ended up deviating from her original set list because she watched what the crowd responded to. Now that's service (and talent!). Then at the end of the night, her crew had to drag her out of the house because she sat down at the piano and started playing show tunes. I wouldn't hire any other band. Truly. Go check them out at one of their free things and see for yourself. You won't be able to settle on any other band. Trust me! The Janis Nowlan Band made our wedding. Not only was Janis fabulous to work with, but we had an awesome time at our wedding and our dance floor was packed. We seriously didn't want the night to end. Janis also played the piano for our ceremony and cocktail hour. As a concert pianist, she is very talented and did a wonderful job. We loved working with her! The band had great entertaining qualities, kept everyone dancing all night. They were very obliging to us and made sure we had everything we desired. thegroom's uncle was a great singer and they allowed him to do a few songs with them. They could not have been nicer and what music, the best! The Janis Nowlan Band played at our wedding July 2010 and they were amazing! I have been to so many weddings and they are by far the best band I have heard. Janis did a great job reading the crowd and kept the majority of our guests dancing throughout the entire night. The one comment that my husband and I hear over and over again about our wedding was that people loved the Janis Nowlan Band. Janis was easy to work with before the wedding, was very responsive to all of our questions and played all the songs we wanted to hear! I highly recommend! Janis and the band were great. They made the party! Our son and daughter-in-law's wedding was amazing! Janis and her band had everyone dancing the entire evening, and the dance floor was still packed at 1:00am. It was a great crowd, but she knew exactly how to keep the party lively . We still hear from guests that she was the best band ever!!! My wife and I had the pleasure of having her perform at our wedding last summer. From the very first note of the night to the rocking finale, Janis and her band were just what we had always wanted in a wedding band, playing a variety of styles from jazz standards to the latest pop music. We had wanted to have a lively, upbeat dance party and Janis did not disappoint. People were buzzing about her performance for days after. If you are looking for the best out there for your special day, look no further than the Janis Nowlan Band! Janis Nowlan Band was WONDERFUL!!!! Our guests were amazed and loved the reception. The band made the night! Without a doubt, the best wedding band around. They took my very little guidance/suggestions and not only met those parameters, they exceeded our every expectation. The vocals, acoustics and energy all were outstanding. I cannot thank them enough! If you want your guests to tell you afterwards that it was the best or most fun party/wedding that they have been to, you need to book Janis Nowland Band. The Janis Nowlan Band was amazing. We received numerous compliments on the band after our wedding. The song selection, energy, and talent were all top notch. Highly recommended! Janice did so much to make our daughters wedding and reception outstanding and she was a pleasure to work with! Janice sang a solo at the wedding that our pastor admitted was very difficult to sing which he along with all others present thought was outstanding. Janice and the band also learned several songs for our event. Janice surprised me with a song that she took the time learn because in the course of one telephone conversation I happened to mention I thought it was a geat song. These are just a few comments we have heard from friends who attended the wedding and reception. * That was the best wedding I've ever been to! * Janice added such a personal touch to the reception. * The band was so energetic. They kept everyone on the dance floor. Janis Nowlan performed a solo at our wedding ceremony and The Janis Nowlan Band performed at our reception. Many, many guests commented on how wonderful her solo was and how it added so much to the ceremony! The Band made the reception! The music kept everybody energized and on the floor! We had the time of our lives thanks to the Janis Nowlan Band!!! I juat go married on Bonnet Island Estate on 5/29/10 and my band was the Janis Nowlan Band. I spoke with Janis several times over the planning over my wedding and she was always helpful and full of great ideas. Many of my guests have commented how wonderful the band was....we were on our feet most of the night! Janis and her band were amazing! Everyone was up out of their seats dancing! They made the night. Fantastic! We booked the Janis Nowlan Band for our wedding 4/17/10. We couldn't have asked for a better wedding reception! We danced all night and simply had a blast! We received so many complements from our guests and had so many people tell us they never had so much fun at a wedding! Janis Nowland band was amazing. We continue to hear how awesome they were from our guests. Janis was very professional and was in constant contact with us before the wedding. She made every effort to do all our requests. The band made our reception wonderful and we are so happy we went with the Janis Nowland band. The Janis Nowlan Band is without a doubt Philadelphia's finest wedding band/party band! It was an absolute pleasure working with Janis in preparation for our spring wedding in 2009. Janis and her band learned so many songs that we were requesting. One being our wedding song which sounded absolutely amazing! Our wedding reception was the most special because of the Janis Nowlan Band. The band had so much personality and they put that love and fun into our wedding. Our guests are still raving about our band! The dance floor was filled all night long! I cannot say enough about how wonderful and talented this band is! From the quality of the sound to all of the great music they know, they truly are unbelievable! It has been a pleasure staying in contact with Janis. We love to see her band perform in the summer for an outside concert! We watch our wedding video and each time are still in awe about all they did to make our wedding reception so amazing! We feel truly honored to have had them for our special day! Janis Nowlan was fantastic! The music was amazing and the band really knew how to get the guests up and dancing. They played such a variety of music to appeal to everyone. The guests loved them and they were the highlight of our reception by far! The one thing we wanted most for our wedding was for our guests to have an amazing time. The Janis Nowlan Band was the BEST entertainment we could have imagined. I can't tell you how many people commented on what a great band we had. Nobody left our wedding early! Everyone danced until the very end -my Dad even ended up paying for an extra hour of music (something he said he would not be doing - lol). Janis worked with us up until the wedding to nail down all of the little details for the big day. She is a very experienced band leader which is something you want for you wedding, trust me. They sing, they dance, they do it all! People still talk about our wedding and it was over two years ago. If you want an amazing band at your wedding, the Janis Nowlan Band is worth every penny. The Janis Nowlan Band was absolutely fabulous for our daughter's wedding. They provided a wonderful brass player for the wedding service, keyboard for the cocktail hour and the most incredible dance band for the reception. I have never been to another wedding where the music was better. Every minute of the music was great. They had incredible variety and truly knew how to get our guests up and dancing. I highly recommend the Janis Nowlan Band for your wedding or any function that requires music. Janis was great to work with from the beginning. She helped with organizing everything. The band was tremendous! They played the entire time and never stopped to take a break. Everyone at the reception danced the whole time. The singers go into the crowd and interact with you on the dance floor, it is a real fun time, while still maintaining a classy feel. We still get compliments on the band from those that attended the reception or those that view our wedding video. Janis lends a personal touch to helping your wedding reception become a truly memorable event. The other thing that is special about Janis and the band is that they take a personal interest in you as well as your wedding. We still maintain a freindship four years later. The Janis Nowlan Band was the highlight of our wedding reception (apart from, hopefully, my new husband and me!). They had the whole crowd dancing, even though the event was held in the afternoon. One of my friends who attended got married two months later and used a different band: she said to me DURING HER reception that she wished people were dancing at hers like they did at mine...(and hers was an evening reception). I'd absolutely encourage any bride-to-be to use this band at her wedding. This band is fantastic and Janis is so sweet and easy to work with!! They were high energy and kept everyone dancing all night. I would highly recommend this band if you want a fun reception with great music!!! All the while my mom was helping us plan our wedding, she kept saying that the band would make or break the reception. Janis Nowlan band *made* it. The music was spot-on; the volume was perfect for a relatively small room; and multiple people who told me ahead of time that they "don't dance at weddings" were up and moving! I feel strongly that if you need to cut something else out of your budget just to make room for a spectacular band, this one would be worth it. Thank you so much. These guys (and girl) are great. The best! Janis Nowlan Band was amazing! We worked hand in hand with Janis and they were a true “WOW” at our wedding. Janis was very personable and very easy to work with. Janis is excellent to work with and really took and interest in our specific likes/dislikes when it comes to music. Janis spent several hours on the phone with me prior to the date to plan the music and the order of events (the band played at our cocktail hour, ceremony, and the reception). We're happy that we chose the Janis Nowlan Band and would definitely recommend them to other couples! Janis Nowlan Band "Party With The Best!" Janis Nowlan. Awesome Inc. theme. Powered by Blogger.